The DJSI (Dow Jones Sustainability Index) updates the survey and methodology of their rating system, including the supply chain section, on a yearly basis. The DJSI questionnaire supply chain indices serve as benchmarks for investors who integrate sustainability considerations into their portfolios, and provide an effective engagement platform for companies who want to adopt sustainable best practices. 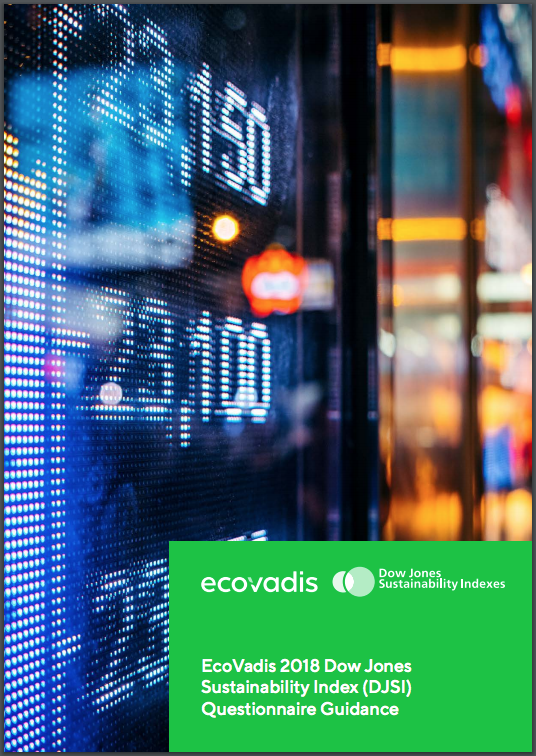 Users of the EcoVadis platform have access to a great set of data on CSR performance of suppliers across all of these themes covered in the methodology: Environment, Labour/Human Rights, Fair Business Practices and Supply Chain; the DJSI questionnaire supply chain section covers similar topics. This focused DJSI questionnaire supply chain guidance is designed to document provides updated guidance on how to use the EcoVadis Sustainable Procurement Platform and other services to complete the Supply Chain Management portion (section 1.6) and the Human Rights portion (section 3.3) of the 2018 Dow Jones Sustainability Index questionnaire.